Firm founded by Dennis W. Daley and Robert R. Heft in Encinitas, California. Dennis Daley argued Tech-Bilt v. Woodward Clyde before California Supreme Court, resulting in a landmark decision establishing good faith settlements in multi-party litigation. 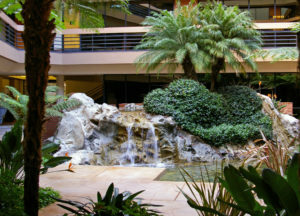 Firm moved to its current location in Solana Beach, California. Dennis Daley argued Knight v. Jewett before California Supreme Court, resulting in a landmark decision establishing the ‘Assumption of Risk’ defense under comparative negligence. 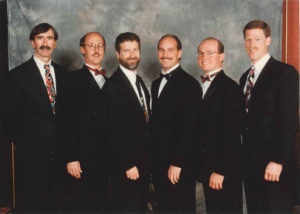 Partners at the 1994 annual holiday party. Presently, Daley & Heft has ten partners and 14 associates. Dennis Daley and Scott Noya, through multiple eminent domain settlements and trials, acquired 26 city blocks in downtown San Diego on behalf of the San Diego Redevelopment Agency, for the development of Petco Park, hotels, office buildings and commercial space. Dennis Daley and Scott Noya acquired, through eminent domain, all reversionary rights to San Diego City streets held by heirs of Alonzo Horton since the 1850’s for the City of San Diego. 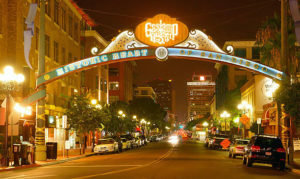 The Gaslamp District in downtown San Diego, California. Dennis Daley represented the Port of San Diego in a suit by the United States of America to acquire the fee interest in the Anti-Submarine Warfare Base on San Diego Harbor. David Berman wins a defense verdict representing the property owner in a personal injury claim. Plaintiff was hit by a BMW that accelerated up and over the curb while waiting for his car to be washed. Plaintiff lost his leg at the knee when hit by the runaway/ suddenly accelerating car. The vehicle driver and car wash settled prior to trial. Powell v. Redhawk Hand Car Wash, et al. Lee Roistacher earns status of California Certified Legal Specialist in Appellate Law. Robert Brockman and David Berman earn a defense verdict in a multiple vehicle collision on Highway 99 near Bakersfield, California. Daley & Heft’s client (defendant driver) was traveling approximately 45 miles per hour when he hit the rear of the vehicle in which plaintiffs were seated. The jury concluded that the farm activities adjacent to the accident scene caused dust which obscured defendant’s vision. Hernandez v. Hodapp, et al. Mitchell Dean designated as lead trial attorney as Daley & Heft assisted the City Attorney’s office in the defense of the City of San Diego and nine individual City police department defendants in the last of the former San Diego police officer Anthony Arevalos sexual abuse cases, Jane Doe v. City of San Diego. The settlement of this pivotal and highly publicized action avoided the possibility that the San Diego Police Department would have been monitored by the federal government. Rick Schneider successfully settled a significant injury case for the City of San Diego. A 7 year boy on his way home from school was struck by a City garbage truck and dragged under the entire length of the vehicle. He suffered massive internal injuries and the amputation of one leg. By the time of trial he had undergone 50 surgeries, and was expected to undergo many more in the near future. His past, recoverable medical expenses were $3.2 million, his life care plan was valued at $16-17 million. Associating in at the eve of trial Rick was able to arrange a $18.5 million settlement. Rick Schneider successfully settled a City of Beaumont excessive force case that left a woman completely blind. A 31 year old woman was shot in the face with a gun-powder charged pepper spray device – at point blank range – during a DUI stop. She was permanently blinded in both eyes, and the officer is facing criminal charges for willfully and unlawfully assaulting a person, under color of authority. Six members of her immediate family witnessed the shooting and filed by-stander claims. Appointed as lead defense counsel, Rick was able to secure a global settlement of all 12 of the Plaintiff’s claims for $18.5 million dollars. A cross-claim for products liability is pending against the manufacturing chain of the pepper gun, including the Swiss manufacturer. Rick Schneider achieved a favorable settlement in a police practices case. A 27 year old man was shot in the head by a Sheriff’s Deputy during a search. The plaintiff was rendered a quadriplegic, and his life care plan was valued at $5.7 million. He was not criminally prosecuted. Acting solely as the re-insurer’s negotiator, Rick was able to secure an agreement at mediation with plaintiff’s prestigious civil rights attorney to settle for $4.5 million. The insured would not consent to that settlement and insisted on proceeding to trial, where a judgment of $7.1 million was entered. Drawing upon his relationship with plaintiff’s counsel Rick was then able to claw back $200,000 and the matter settled for $6.9 million. Mitch Dean and Heather Paradis won an 8-0 defense verdict in Federal District Court for the City of El Cajon and one of its police officers in a case involving the shooting of a suspect who, as it turned out, did not have a gun. In the case of Goodlow v. City of El Cajon the plaintiff sued the City and the officer under 42 USC section 1983 for excessive force and the violation of plaintiff’s 4th Amendment constitutional rights. Plaintiff’s attorney asked the jury to award “seven figures.” Mitch argued that due to the actions of the plaintiff, the officer reasonably believed, although mistakenly, that the plaintiff was reaching for a gun. Even though this case presented the shooting of an unarmed African American man, an issue prominently under the national spotlight, the jury was able to focus on the facts of this case and render a defense verdict. Rick Schneider participated in another favorable settlement in a public transportation case. A 16 year old high school student, who spent the prior summer at Stanford in the Summer Semester program studying neuropsychology, rode a municipal bus home after the fourth day of her senior year in rural Riverside County. The bus driver, employed by the vendor bus company, on her second day on the job and without having received any on the route training, stopped the bus approximately 50’ past the insured’s delineated bus stop, completely blocking the lane of travel. This “forced” the plaintiff to cross the rural highway, with a speed limit of 45 mph, mid-block, as opposed to the intersection where the stop was located. She was struck by an on-coming car, flipped onto the hood and hit her head on the passenger-side post. She was evacuated unconscious and spent several days in a coma, complicated by strokes. All experts agreed she would be confined to a wheelchair for the rest of her life and would require 24/7 care during that time. The present value of her life care plan ranged from $4.3M to $6.8M. Her future loss of earnings was set between $1M and $1.6M. Total economic damages, including past medical damages of $600K, thus ranged from $5.9M to $ 9M. Plaintiff’s initial demand was $22M. Rick was asked by the contracting transportation agency’s excess carrier, which attached at $2.5M, to file an Association of Counsel four days prior to the June 12th trial call. At the trial call, the parties were ordered to a Mandatory Settlement Conference. After 8.5 hours of negotiation, a settlement of $7.350M was placed on the record; the vendor bus company agreed to pay its policy limit of $5M; the insured contracting transportation agency paid $2.1M; and the municipality, which owned and controlled the stop, paid $250K. The excess carrier for the contracting transportation agency, which retained Rick, paid nothing.